While most Independence Day speeches are - and have been - celebratory in nature, many have gone beyond mere celebration - some with political motives in mind, and others reflective, and willing to ask questions about freedom and independence. Some, in certain ways, combined all of these elements. 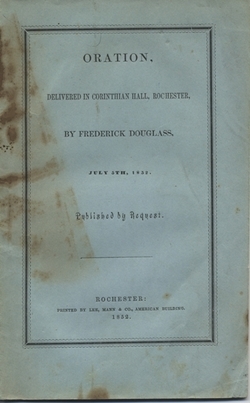 One well-known example is a speech delivered by Frederick Douglass at the request of the Rochester Anti-Slavery Sewing Society on July 5, 1852; the (slightly stained) cover of our copy is seen here. The speech was delivered as part of the Independence Day observances in Rochester, NY. Douglass, of course, was a man who was born into slavery, escaped from slavery, and went on to become one of the foremost abolitionists in the United States. He was also one of the abolitionist movement's greatest speakers. Fellow Citizens, I am not wanting in respect for the fathers of this republic. The signers of the Declaration of Independence were brave men. They were great men too — great enough to give fame to a great age. It does not often happen to a nation to raise, at one time, such a number of truly great men. The point from which I am compelled to view them is not, certainly, the most favorable; and yet I cannot contemplate their great deeds with less than admiration. They were statesmen, patriots and heroes, and for the good they did, and the principles they contended for, I will unite with you to honor their memory. What, to the American slave, is your 4th of July? I answer: a day that reveals to him, more than all other days in the year, the gross injustice and cruelty to which he is the constant victim. To him, your celebration is a sham; your boasted liberty, an unholy license; your national greatness, swelling vanity; your sounds of rejoicing are empty and heartless; your denunciations of tyrants, brass fronted impudence; your shouts of liberty and equality, hollow mockery; your prayers and hymns, your sermons and thanksgivings, with all your religious parade, and solemnity, are, to him, mere bombast, fraud, deception, impiety, and hypocrisy — a thin veil to cover up crimes which would disgrace a nation of savages. There is not a nation on the earth guilty of practices, more shocking and bloody, than are the people of these United States, at this very hour. For the entire text of the speech, you may, of course, come in and read our copy. The text is also available online - you can go here for the full-text of Douglass's July 5, 1852 speech. Douglass, Frederick. Oration, Delivered in Corinthian Hall, Rochester. Rochester : Lee, Mann & Co., 1852. Maier, Pauline. American Scripture : Making the Declaration of Independence. New York : Alfred A. Knopf, 1997. Smith, Paul H. Time and Temperature: Philadelphia, July 4, 1776. Washington: Library of Congress, 1977. Travers, Len. Celebrating the Fourth : Independence Day and the Rites of Nationalism in the Early Republic. Amherst, Mass. : University of Massachusetts Press, c1997. Colaiaco, James A. Frederick Douglass and the Fourth of July. New York: Palgrave Macmillan, 2006. Heintze, James R. The Fourth of July Encyclopedia. Jefferson, NC: McFarland, 2007.